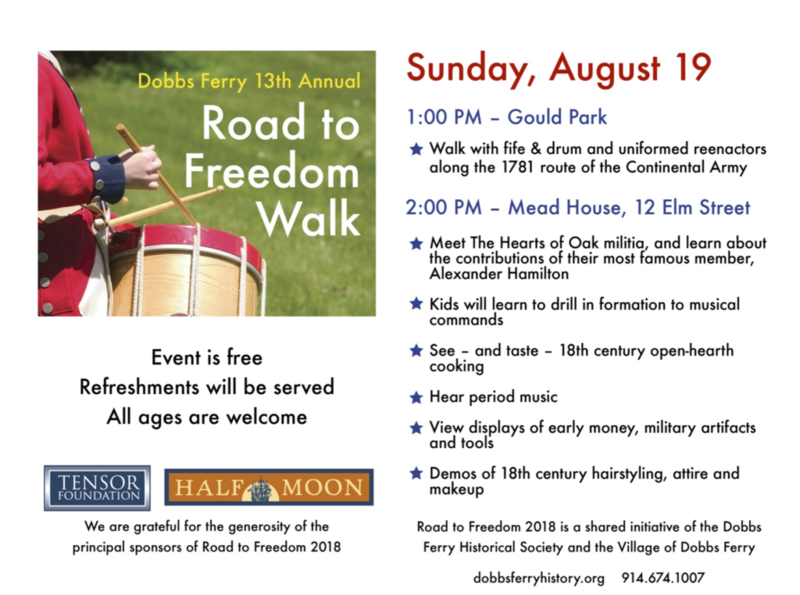 Starting at Gould Park at 1pm, we will walk with the fife and drum along the 1781 route of the Continental Army. At 2pm at the Mead House at 12 Elm Street, we will meet The Hearts of Oaks Militia, see and taste 18th century open hearth cooking, hear period music, view displays of early money, military artifacts and tools, and see demonstrations of 18th century hairstyling, attire and makeup. This event is free to all and refreshments will be served. We are grateful for the generosity of the principal sponsors of Road to Freedom 2018 : Tensor Foundation and Half Moon Restaurant. Please join us for a fun afternoon!